Watertown Firefighter David Meagher, left, Deputy Fire Chief Dan Tardif and Watertown Police Chief Michael Lawn unveil the First Responders stamp at a ceremony at the Watertown Police Station. The U.S. 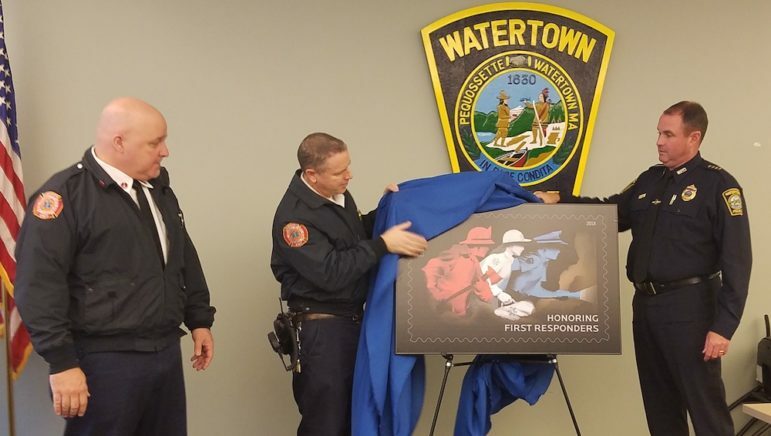 Postal Service honored Watertown’s police officers and firefighters Thursday with the unveiling of a stamp recognizing first responders. The Post Office is presenting local departments with a plaque featuring a larger image of the limited edition stamps. Linda Beattie, manager of Watertown’s three post offices, presented the plaques to Watertown Police Chief Michael Lawn, Watertown Deputy Fire Chief Dan Tardif, and Watertown Firefighter and EMT David Meagher during a ceremony at the Watertown Police Station. 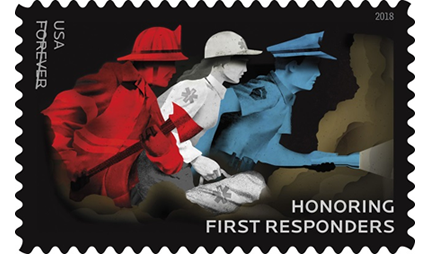 A closeup of the First Responders Stamp being sold by the U.S. Postal Service. The stamp features three figures: a red firefighter holding an ax, a white paramedic holding a medical bag, and a blue police office shining a flashlight into the dark background partially filled with smoke. The stamp was designed by artist Brian Stauffer, who worked with art director and designer Antonio Alcalá and designer Ricky Altizer. Stauffer’s illustrations have appeared in The New York Times, Time magazine, The New Yorker and other publications worldwide. His is known for bridging traditional and digital realms to create a conceptual take on social issues, according to the U.S. Postal Service, according to the USPS announcement about the stamp. Members of the Watertown Police and Fire departments, joined by Linda Beattie, left, the manager of Watertown’s Post Offices, for the local unveiling of the First Responders stamp. The stamp was first unveiled in September at the Aerial Fire Depot and Smokejumper Center in Missoula, Mont., which trains firefighters who parachute into remote areas of national forests to combat wildfires. The First Responder stamps can be purchased at the Watertown Square Post Office on Main Street. “They are commemorative, so they will only be around until the run out,” Beattie said. The stamps can also be purchased through the Postal Store at usps.com/shop, by calling 800-STAMP24 (800-782-6724).